It's been over a year since this orchid plant last bloomed. While orchids don't require a whole lot of attention, I think I forgot to water it for a long time and it wasn't happy with me because of that. I now make a point to get water to it weekly and started feeding it regularly. I'm glad I patiently waited for it to get back on its feet. These blooms should last for months. I won't take them for granted. 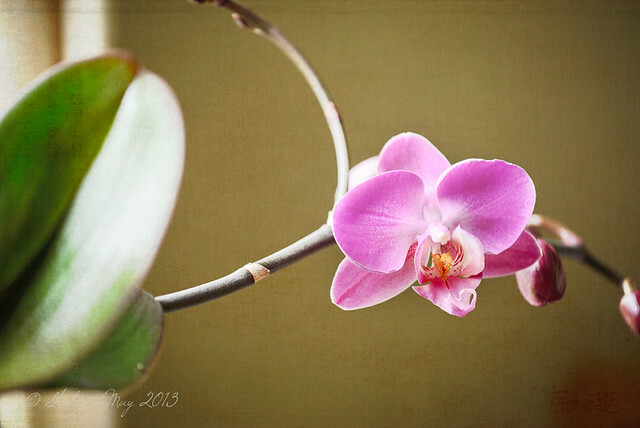 Textured using Kim Klassen's May and Nancy Claeys' Sakura. Shared with Texture Tuesday, Tuesday Muse and Communal Global. Such a simple and elegant flower. Beautiful. Lovely! I adore orchids and have a white one re-blooming. Such a treat! I want an orchid but always fear I will not keep it alive. I love the greenish/yellow blooms on some I've seen. Oh what a gorgeous orchid!! Beautiful shot! I love the composition with than wonderfully curved stem blurring as it curls off into the background! Every . single . week, every one, I pass the orchids at the grocer, pause and contemplate - "I think I can", "I think I can", "I think I can". And every . single . week, every single one, I proceed with getting my groceries and don't buy one. But during those weekly visits I visualize all the incredible macros I could take. Yea, I'm a little in awe of this. Beautiful flower, delightful lighting. a beautiful bloom and so perfectly processed! Beautiful. My mom LOVES all kinds of orchids and they grow fabulously for her. She's up in Washington. My son's teacher gave me one for Christmas for helping in the class and I love it. The leaves are growing like crazy, but no more blooms since the ones that were there at Christmas. I better get some food for it! I've had so many orchids in my life and each one died soon after I got it. I read a lot about how to take care of them but nothing worked for me. coming from TT - wow lovely lovely -- a pop indeed! Very pretty, I have never tried orchids... maybe I will. Beautiful. I have not been able to grow any myself. Bt, when I lived in Maryland I was near a commercial grower that let me visit his hothouses and enjoy what he grew.